The 380-600 Thermometer Shelter will house a thermometer or temperature dial. 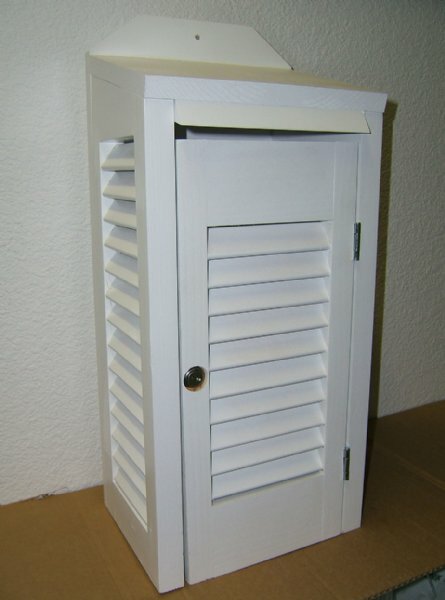 It is constructed of wood with louvered front and sides. The bottom panel has holes to increase natural ventilation. Instrument shelters protect temperature and relative humidity sensors and other instruments against errors and damage due to solar radiation, wind, and precipitation. The 380-600 Thermometer Shelter will house a thermometer or temperature dial. It is constructed of wood with louvered front and sides. The bottom panel has holes to increase natural ventilation. The shelter is painted white and includes a lock and key. Mounting holes are provided to install the 380-600 on a wall or post. Ideal installation is on a wall with a northern exposure to prevent excessive heating by the sun. If installed on a post, protection from direct sunlight must be provided. Shipped assembled.